4 wins, placed 11 times and 3 056 000 FF. 4 wins, Poule d'Essai des Poulains (Gr.1), Saint James' s Palace Stakes (Gr.1), Prix du Moulin de Longchamp (Gr.1), placed 5 times, 3rd Prix Jacques le Marois (Gr.1). A share of Kingmambo has been sold, in june 2000, more than 5 millions of francs. Retired to stud since 1994 in the USA. One of the Top Sires in the World for years. His son King Kamehameha is the Leading Japanese Sire in 2010. - AL NASR (Lyphard), 7 wins from 2 to 4, Prix d'Ispahan (Gr.1), Dollar (Gr.2), La Force (Gr.3), de la Côte Normande (Gr.3), Exbury (Gr.3), de Suresnes (L.), 2nd Prix Eugène Adam (Gr.2), d'Harcourt (Gr.2), 3rd Prix Ganay (Gr.1), 1 609 000 FF. Sire. - JEWELLED REEF (Mill Reef), 1 win at 2, Bacon St. (L.) at Newmarket. - HOUSE OF GLORY (Habitat), 8 wins in France and Belgium, 25 928 euros. - Périple (In The Wings), 2 wins in France at 3, placed 6 times at 3, Prix de la Contrescarpe at Longchamp, 3rd Prix de Lutèce (Gr.3), Michel Houyvet at Deauville (L.), Perak Derby (L.) ; 1 win at Singapore. - Jabal Tarik (Riverman), 4 wins, placed 18 times, Prix des Marronniers at Longchamp, 3rd Prix du Lys (Gr.3). 644 350 FF. Sire in South Africa. - ELECTRICAL WIND (Green Dancer), 3 wins. Sire in Cyprus. - Swinging Dancer, 3 wins at 3 in Germany, placed 7 times, 3rd Preis der Deutschen Bank A.G. (L.) at Bremen . - Sakura Victory (Lomond). Sire in Japan. - CHEF DE RACE (Rainbow Quest), 1 win in Marocco. Sire in Marocco. - REX REGINA, 3 wins, Prix La Sorellina (L.), 47 450 euros. Brood mare. 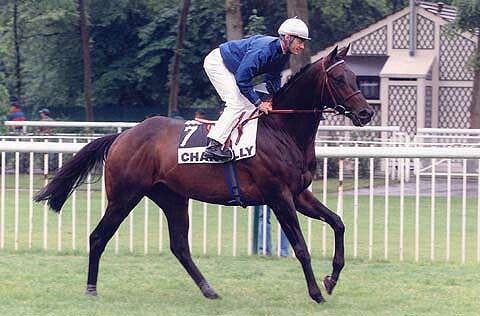 - Chantilly Fraise (Lyphard), placed. Dam of winners in Japan. - KEBAH (Bel Baraka), 7 wins, Prix de la Salamandre (Gr.1), placed 9 times, 2nd Prix La Rochette (Gr.3), La Coupe de Maisons-Laffitte (Gr.3 - twice), 3rd Prix Robert Papin (Gr.1), Henry Delamarre (Gr.2), Exbury (Gr.3), Grand Prix de Marseille (L.), 4th Prix Exbury (Gr.3). Sire. - L'ENSORCELEUR (Le Fabuleux), 2 wins, Grand Prix de Deauville (Gr.2), 2ème Prix de la Côte Normande (Gr.3). Sire. - LYPHEOR, 3 wins, Prix Quincey (Gr.3), 3rd Prix Jean Prat (Gr.2), La Rochette (Gr.3). Sire. - Cox's Enchante, 1 win, 3rd Oriental Magic Hdp. (L.). - Tranquility, 6 wins, 2nd Gosforth Park Fillies Guineas (Gr.2). Brood mare. - GUIFORD, 5 wins, Gran Premio de San Sebastian (Gr.2) and 172 000 FF. - SHOEN, 9 wins, Prix des Yearlings (L.), 2nd Prix La Rochette (Gr.3), 3rd Critérium de Maisons-Laffitte (Gr.2). Sire. - TOUROVA, 5 wins, and 433 150 FF. Dam of My Way, 5 wins, 3rd Prix du Haras de la Huderie (L.) and 518 000 FF. - Pharinia, placed in France. Dam of Peerles Pink, 6 wins, 3rd Bayerischer Stutenpreis (L.), dam of Peel River, 11 wins, 2nd Prix du Lion d'Angers (L.), 185 573 euros.